I was feeling a bit crafty today and something edible was the result. I quite enjoy making pasta by hand and since I've done it rather a lot, I can now knock it out in about 15 minutes. Cutting it into noodles is the speedy option, but occasionally, the fiddly and pretty is what appeals. We had made some ravioli last night, so I still had lots of filling on hand. I just made up the ravioli filling and you could improvise something with whatever vegetable you have on hand. This sweet potato filling was made from boiled, then mashed sweet potato, flavoured with a bit of thyme (dried, from last year's garden), feta, and salt and pepper. 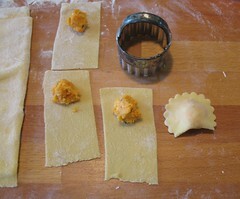 I've now worked out my favourite method for making the ravioli itself. Make up a double-batch of pasta dough (1.5 c flour, 0.5 c semolina flour, 2 eggs) and roll the dough into a long banner of pasta (I recommend using a proper pasta roller rather than trying this with just a rolling pin). Flour your work surface and spread out a section of the dough. Cut it in half lengthwise and then into sections the same width as your fluted cookie cutter. Place blobs of filling (not too much!) on the upper half of each rectangle of pasta (see photo above). With a pastry brush or finger, draw a line of water around the outside edge. Fold the lower half up over the filling and line up the edges. Cup your hand around the filling and work all the air out as you seal it up. Cut with the cookie cutter, leaving part of the fold intact for a pretty scallop shape. The cookie cutter is not only to make it pretty, but also to help firmly seal the ravioli. If you want to make extra to save for later, freeze the ravioli in a single layer on a floured cookie sheet before storing in a bag or box in the freezer (this prevents it from sticking together). You can also do this with all the extra bits of pasta that get cut off. Homemade ravioli takes about 4 minutes to cook in salted, boiling water. that looks phenomenal! I haven't had any luck finding a pasta roller yet, but if you know the name of the store you got yours at, i'll pick one up next time i'm in town. The bread recipes have been a huge hit here, i've got people all over the office making it now. blaise: We got our "Jumbo Handy Machine" (the made-in-China knockoff of the Italian Atlas and Imperia pasta roller) at La Soupiere. I would have expected it to be a fairly typical kitchen-shop item.